optional: 1/4 cup almonds or walnuts or 1/4 cup toasted coconut flakes or 1 tsp. of cinnamon and 1 tsp of agave syrup. 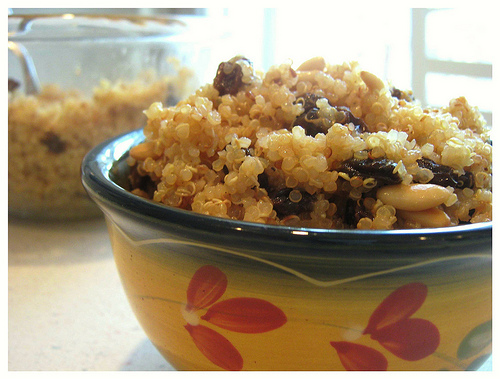 Mix the quinoa with the oil and the salt, put raisins on top. Buckwheat flour is widely available, but since I always have some cooked grains lying around, I came up with this breakfast recipe. Feel free to add blueberries, if you wish. 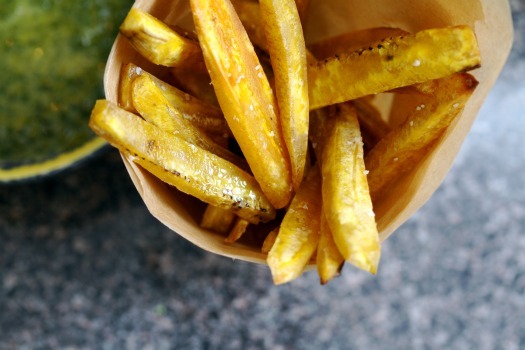 Mix everything together and fry on a lightly oiled skillet. Put the kale into a frying pan, add 1/2 cup of water, cover and let simmer for about 2-3 minutes, until the kale is soft. Open the lid, add the onion and the olive oil and saute for about 2 minutes. add the mushrooms and sautee for another 2 minutes. Add the tomato and possibly, more olive oil. Add the parsley and sautee for about another minute. Add the tobasco. mix well. Add the eggs and cook for another minute or two, making a scramble. 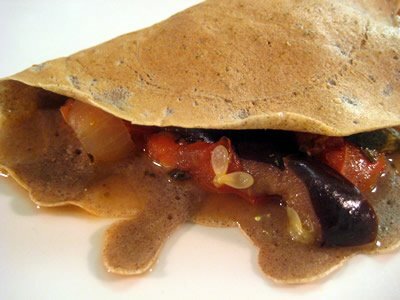 We also love eggs over buckwheat with onions: hearty and delicious. 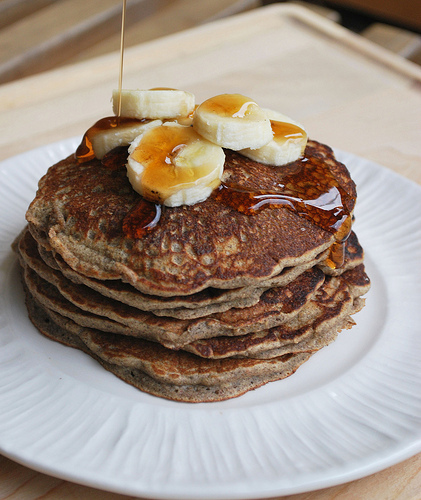 Do you have any gluten-free breakfast recipes? 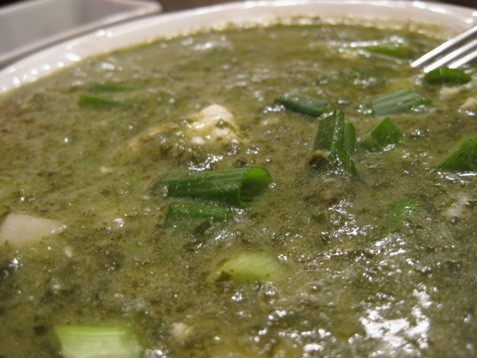 I love this green, low-calorie, nutrient-packed soup. If you don’t like tofu, you don’t have to put it in. 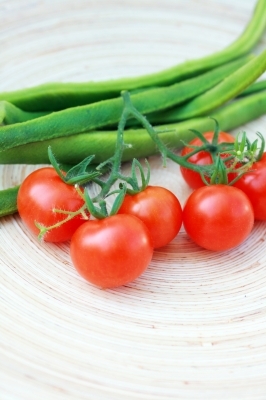 You can also add potatoes, whole wheat pasta or beans of any kind. You can season the soup with some curry for a more of an exotic twist. Yo u can even add some brown rice or buckwheat! Heat the olive oil in a large pot. Cook the onion and garlic until soft. Stir in the kale and cook until wilted, about 2 minutes. Stir in all other ingredients, except for the green onions. Simmer on medium heat for about 2o minutes. Add more water if needed. Add the green onions. Season with salt and pepper to taste. When you think of a sandwich, do pastrami or turkey come to your mind first? Or is it the gooey cheese? Most people I know have no idea how to make a vegan sandwich, let alone how to make one that tastes good. 1. Pick good bread. 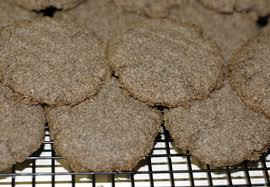 Spelt tortillas, whole wheat slices, sprouted rolls – try to go as whole grain as possible. 2. Pick your spread. Hummus, pesto, sun-dried tomato paste, avocado, avocado or vegan mayonnaise with a bit of curry, nuts, processed to a paste with some parsley and garlic added to the mix… The list is quite long. Even sweet purees, like mashed dates or bananas work, especially if combined with bitter veggies or barbecued or marinated tofu or tempeh. I also like miso paste, combined with tahini paste. Pure tahini paste and nut butters work, too. 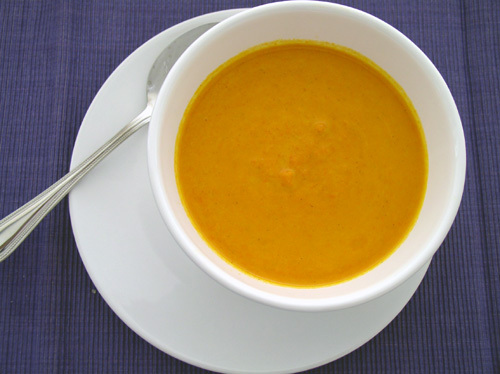 Carrot butter is awesome: puree some cooked carrots and add some olive oil and a bit of miso. Applesauce is ok for certain combinations. 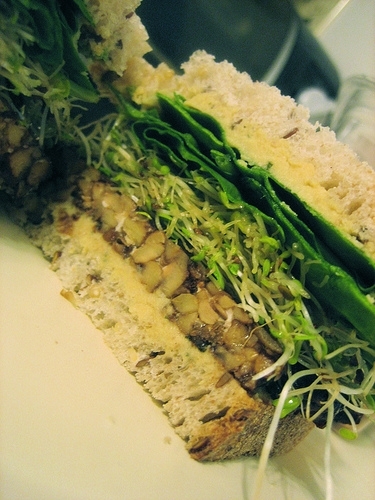 To make a good vegan sandwich, you must be generous with the spread, otherwise the whole thing would turn out dry. In a regular sandwich, meat and cheese are the things that keep it moist and delicious. While making a vegan sandwich, put the spread on both sliced of the bread used. 3. 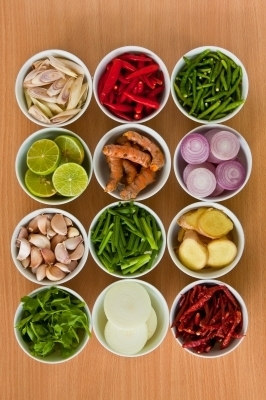 Pick your veggies. Make sure you put a lot of vegetables in your sandwich. Avocado is almost a must and so are the greens and the tomatoes. 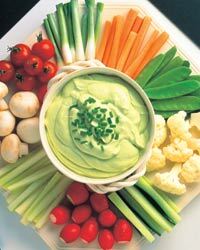 You can also put cucumber slices, grated carrots, celery and onions. Sauerkraut works in some cases, too. 4. Sprinkle some salt and pepper on the veggies. You can also sprinkle some basil or parsley or even curry. Some balsamic vinegar works sometimes. 5. Pick your protein. Surprisingly, a scoop of cooked quinoa works well. Tofu or tempeh work better. Pumpkin seeds are fine and so are pecans of walnuts. I don’t like processed soy products, like soy burgers, but they definitely work, taste-wise. 6. Add something fun, like tobasco sauce or coconut or raisins or dried cranberries. This is not mandatory. What’s your favorite vegan sandwich?